Watching whales and chasing rainbows. My fourth day in Iceland was full of surprises. The stable wasn’t due to pick me up until afternoon, so I spent the morning aboard the Andrea, watching whales, dolphins, porpoises, seabirds and shoals of seriously motivated mackerel in the bay outside Reykjavik. While I’ve come across numbers of dolphins, several sharks, and even a couple of whales in my sailing years, I hadn’t quite got my head into the Icelandic idea of whale-watching. Generally, whale-watching involves a lot of watching and not a lot of whale. 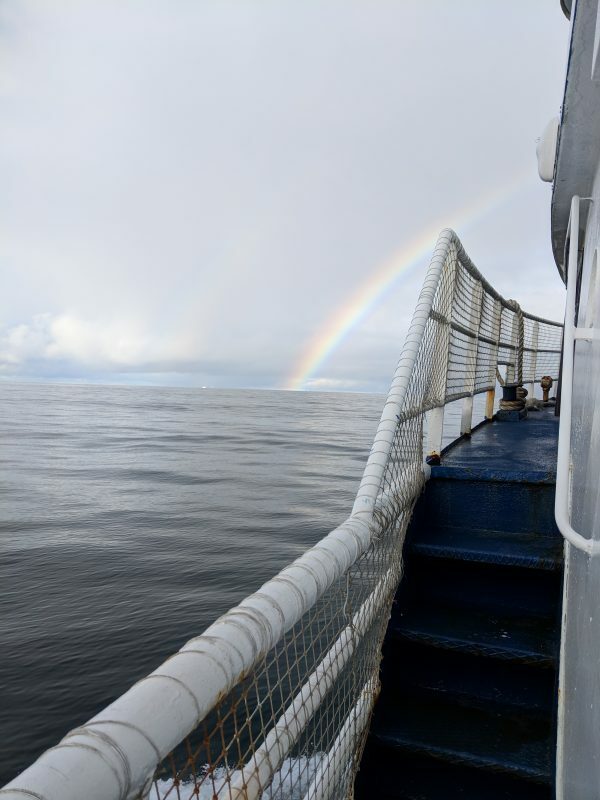 The marine biologist aboard promised us there would be whales at the end of the rainbow, and he wasn’t kidding. There were many, many whales, possibly because of the presence of the aforementioned mackerel. As the conditions amounted to a glassy calm day (on the North Atlantic in September???) they were also very visible whales. 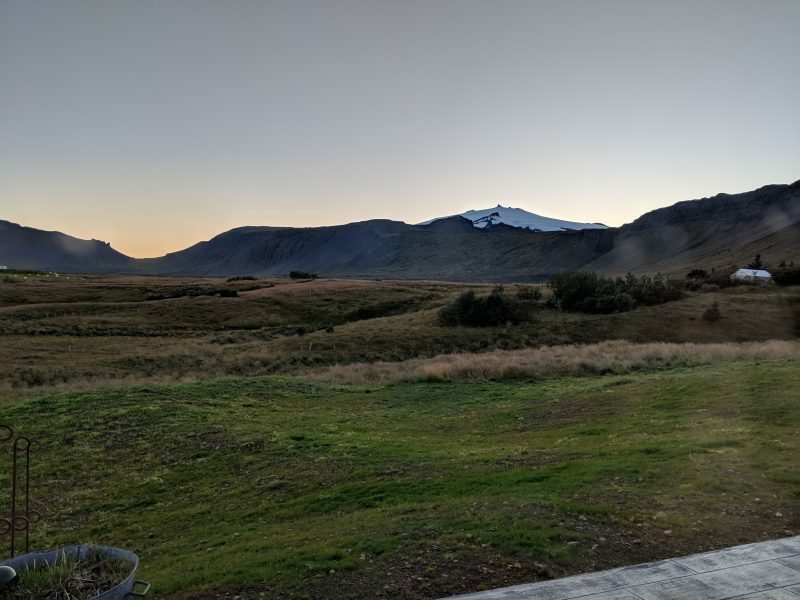 This was the view from my window at the stable: Snæfellsjökull. My second surprise of the day was the bus station. The stable set the pick-up point in Reykjavik central bus station. I’ve had the dubious privilege of spending time in various bus stations around the world, and Reykjavik failed to live up to my expectations. For starters, it was clean. There was even a guy cleaning the windows. The bathrooms were functional, and not littered with multi-species feces, used needles, or vomit. There was actually soap in the soap dispensers. Taken aback by all this, I pulled out my phone and found actual, functioning WiFi. Rather broken by this reversal of normality, I sat quietly, updated my social media like a good author, and waited for my pick-up (which was on-time, and was even expecting me). 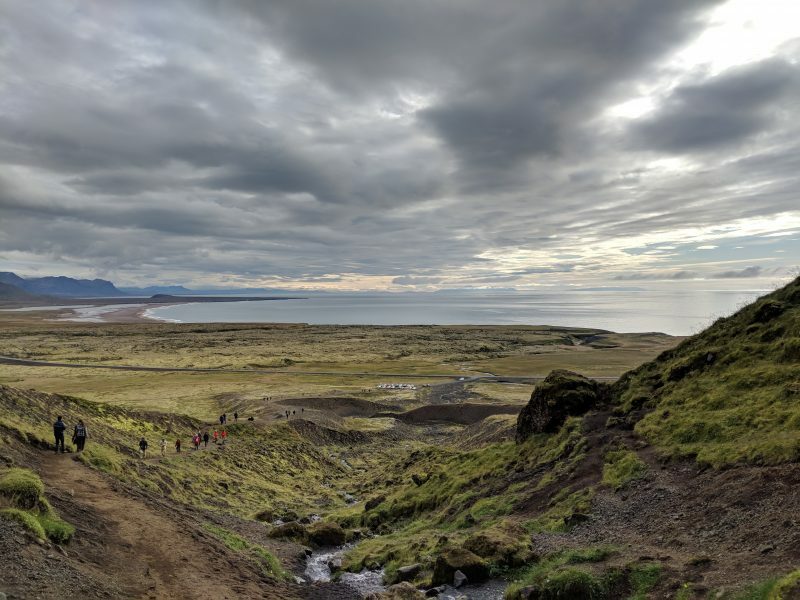 My final, and possibly even best, surprise of the day was that after a very scenic drive along the West coast to Snæfellsnes, my room in the guesthouse looked out at Snæfellsjökull, the setting for Jules Verne’s Journey to the Centre of the Earth. That and 20,000 Leagues Under the Sea were childhood favourites. I’m fairly sure I still have copies somewhere. And there was a window seat in that window. I did get some reading time to spend in it, but if I’m honest I spent more time gawking at the view than reading. 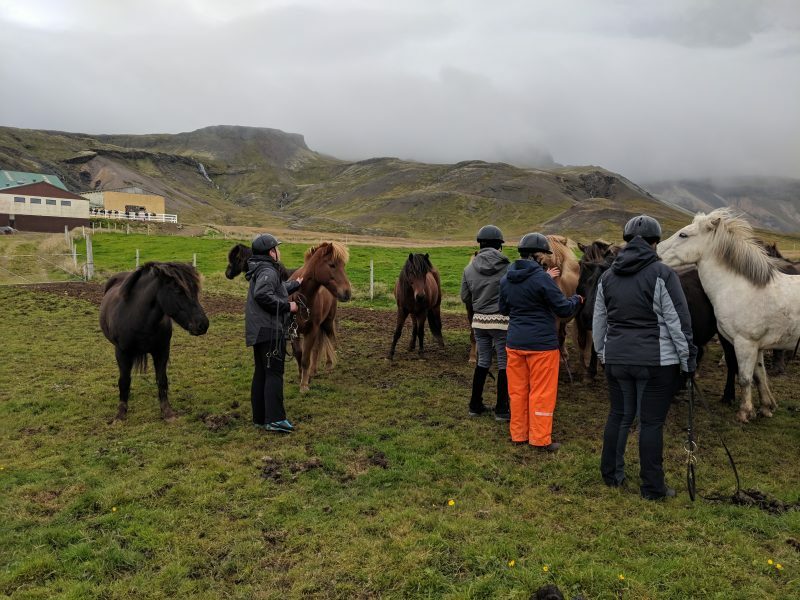 Iceland: Day 5 – Icelandic Horses! From the waterfall South towards Gröf. Because rides from Gröf make full use of the wide stretches of beach exposed at low tide, we actually had most of the morning free to explore the countryside on foot, including the waterfall cave just above the stables. To give you some idea of the scale of the land, the rise I’m standing at the top of looked like a small hill from the car park at the bottom (yep, it’s there. Just really small.) As you can tell from the tourists I’m using for scale…it’s not a small hill. The air in Iceland is almost completely pollution-free, and there are very few large trees, or buildings, or most other things that my brain uses for guess-timating distance, so I spend a lot of time in Iceland headed towards something I’d’ve sworn I could reach out and touch when I started. Another fun fact about Iceland? You can fill your water bottle from the waterfalls. I can’t even think of any other country I’ve been in where that would be safe without filters, boiling, and probably an exorcism. Icelandic horses meeting the riders. Image credit Dr. Andreas Putz. After lunch, we headed out to meet the horses. Icelandic horses look ridiculously small to be able to stroll off with a full-grown adult aboard, but in actual fact their comfortable weight tolerance is, on average, 80 kilos. They’re also gregarious, highly intelligent, and, dare I say it, really cute. They’re one of the oldest breeds of horse, having been bred pure since the Icelandic Althing passed a law prohibiting the importation of horses into Iceland in 982 AD, which is still enforced today (and, in fact, that law is the reason that ‘Lord of the Rings’ ended up being filmed in New Zealand, not Iceland…true story). 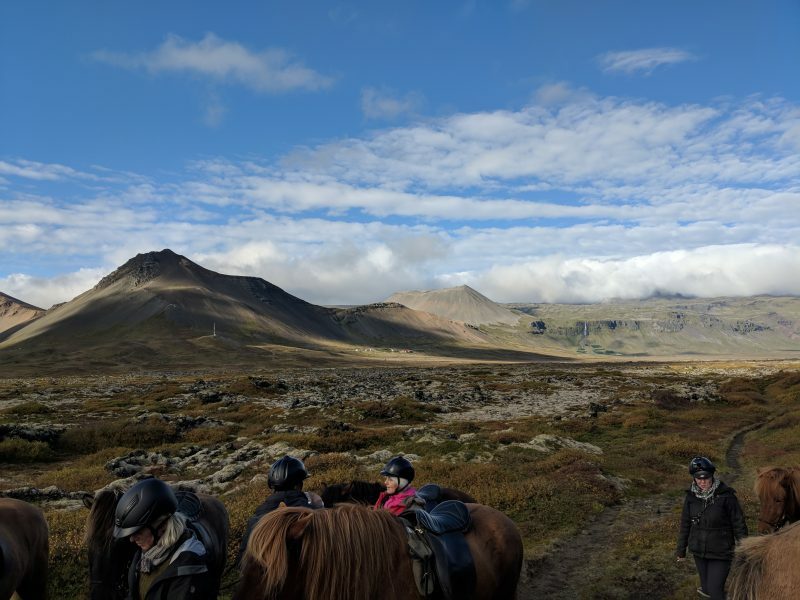 We headed down to the beach, and spent a happy few hours admiring the horses, the scenery, and practicing the Icelandic horse’s unique gait: the tölt. Icelandic horses can and do trot when they’re not under saddle, but with a rider aboard, your choice of gears is walk, tölt, canter, and gallop. Tölt itself has at least two speeds; a pace barely above a walk, which feels like riding a flying carpet, and the considerably faster flying pace, which can easily keep up with a canter if you know what you’re doing. The faster tölt can also be very comfortable if you’re in on the vital secret, which is to put your saddle about 20 cm further back than you would on most European breeds, and then sit yourself well back as well. The reason, as I found out this trip, is because the power of the tölt comes from the hind legs; the further back your weight, the easier on the horse, and, not at all coincidentally, the less your tailbone imitates a jackhammer. Icelandic horses have no objections to rough country. Image credit Dr. Andreas Putz. Day two of riding is always a handy reminder that you use a surprising number of muscles riding despite the horse doing most of the work, and also that there are apparently muscles you only use when riding. We picked up our horses from the pasture they’d been enjoying overnight, and began to circle back towards Gröf…across a lava field. 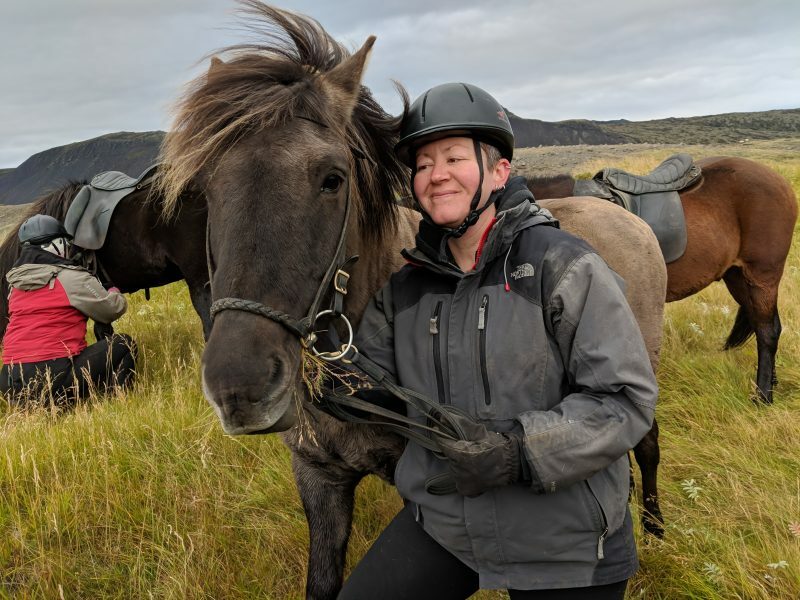 Icelandic horses are, I’m convinced, the only successful outcross of a horse and a mountain goat, because there were entire sections of that track across the lava field where I would probably have broken my neck if I’d been on foot. Icelandic horses (with a rider aboard, mind you) simply take a really good long look and get it done. Even shod in metal shoes that offer very little traction, they happily walk off across bare rock, skirt massive holes where ancient lava subsided, and scramble up and down steep bits – and barely ever stumble or slither doing it. I was probably sweating more than my horse after a couple of hours of that. As you can see, the weather was clear and nice – I managed to sunburn my nose, to the complete non-amusement of my colleagues when I got home again. The Horse and His Author. Image credit Dr. Andreas Putz. On the third day, we headed further west, to Arnarstapi, along the top of the coastal cliffs. I was doing my best not to gloat too much that day: the horse I’d ridden on day 1, Þór (Thor), and I had taken a liking to each other, and I was lucky enough to get him again on day 3. That is to say, I thought he was awesome, and he apparently thought I made a great head-scratching post, even barging through the group during a rest-stop the day I wasn’t riding him to rub his head all over me. Iceland has a lot of rivers and streams, and when they hit sudden changes of altitude in the terrain (Icelandic geography does that a lot), they turn into waterfalls. We rode across several waterfalls that morning, and quite often the horses paused to have a quick drink with the fall only a couple of metres off to one side. It was very much like riding out of the 21st century and into an ancient story, and the views were breath-taking. The Arnarstapi Arch. Image credit Dr. Andreas Putz. Arnarstapi itself was well-worth the trip; poised on basalt cliffs over the North Atlantic, it used to be a fairly important trading post. 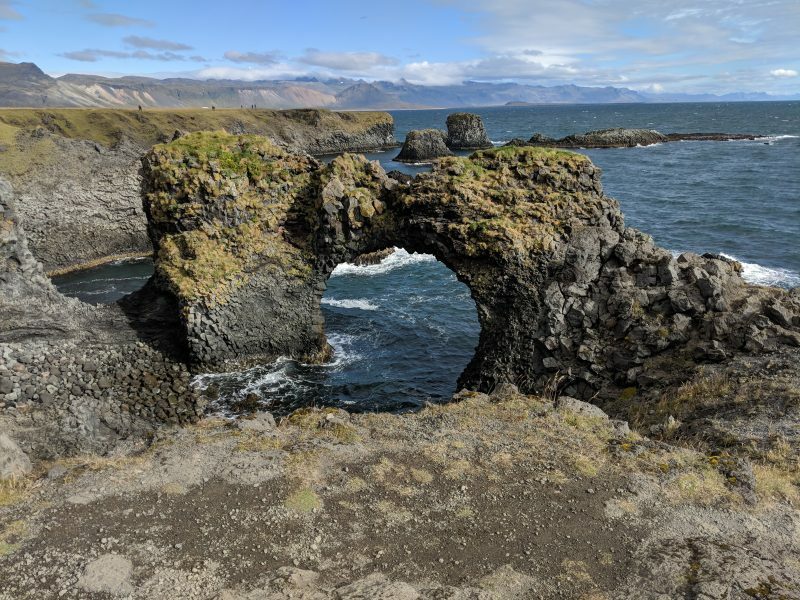 By and large, these days, it’s summer houses, but there is still a small harbour, and a beautiful walk along the coast past the Arnarstapi arch. On the way back to Gröf, I got further proof that Icelandic horses are sure-footed. Our guide reined off the path and headed towards the edge of the cliff, and the rest of us, like good little lemmings, followed him. We’d been taking fairly frequent rest-breaks to let the horses take a breather and to admire the views; I suspect most of us assumed that we were headed for another one. Nope! Viður vanished progressively down a track on the slope towards the beach that I’d’ve thought twice about trying to climb down, and the first of the group in line followed after him, a rather fixed smile on her face. Lucky me, I was third in line. Also lucky me, Þór had no hang-ups about his ability to walk on air if that was what it took, and strolled cheerfully off the edge in turn without flicking an ear. Shamed by my horse’s unruffled calm into at least pretending that I was cool with Spiderman imitations, I let him take care of the technical bits and concentrated on staying on. Sure enough, we reached the bottom in good order and were able to watch everyone else coming down. It was a fantastic three days. We all wound up in the main common room of the guesthouse to enjoy a very good final dinner and listen to one of the group trying out Viður’s digeridoo, and I had one of those awesome moments of realisation that I was a Gibraltarian sitting in an ex-sheepbarn in Western Iceland, listening to a German musician play the didgeridoo. Every so often, you simply can’t make it up. You’ve made me determined to go myself one day. I’ll probably be much less adventurous, but I want to at least meet an Icelandic horse. Icelandic horses are awesome 🙂 I’m happy I gave you the Iceland bug – I hope I can bribe you for photos!